Fairly fast moving novel that can keep you guessing as to what’s happening next. Quite believable for the most part. This is probably the worst Grisham yet. The central characters are unbelievable. The suporting characters add little and are usually sterotypes. The book weaves a story around three individuals who carry a lot of personal baggage and how they connive and scheme using their limited legal knowledge to overcome there problems . 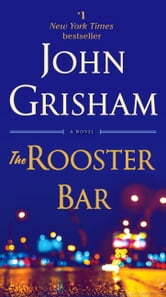 While "The Rooster Bar" is a well-written tale, the premise is ridiculous. Three students at a lowly regarded for profit law school decide to leave school in their last semester because of poor job prospects and a poor chance of passing the bar exam. They embark on a plan to pretend to be lawyers, picking up clients who are poor and need help. When their plan goes awry, they skip town. To say more would ruin the story for those who choose to read this book, which I assume has sold a lot of copies due to the author's name. Plot line not very believable nor is the reader ever invested in any of the main characters' outcomes.